A diagnosis of head and neck cancer is a life-changing event. Many people find that learning more about the details of a loved one’s cancer type and treatment gives them a feeling of empowerment and helps them cope with the changes that follow a cancer diagnosis. 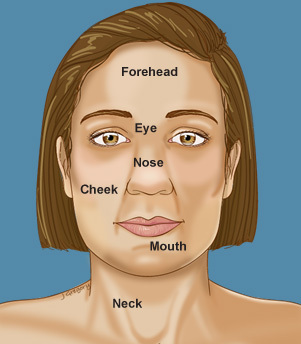 This section of the Head & Neck Cancer Guide includes detailed articles about specific cancer types categorized by the location of the primary (first) tumor. Cancer can occur when abnormal cells grow and spread quickly, forming a mass called a tumor. Tumors can be non-cancerous (benign) or cancerous (malignant). Sometimes cancer cells break away from the original tumor and travel to other areas of the body, where they keep growing and go on to form new tumors. This is called metastasis. Cancer can occur in any tissue or organ in the head and neck. Head and neck cancer is a term used to describe a range of malignant tumors that can appear in the mouth, throat, larynx (voice box), nose, sinuses and around the eyes. Cancers are treated according to the location of the primary tumor, or where the cancer started in the body. It is important to know the exact medical name of the cancer in order to find the right information. The treatment for sinus cancer is not the same as for oropharyngeal cancer, for example. If you are not sure what the cancer is called, you can ask the person with cancer or a doctor or nurse to write it down for you.